This resource is a "best available guesstimate" of the buildup of NATO forces in support of Operation Allied Force, circa June 1999. The careful reader will notice that there are more than a few discrepancies between the totals reported and the specific deployments noted (which do not "add up" to the officially reported totals). This probably reflects some combination of incomplete deployment reports, changes in the allocation of previously deployed aircraft to the Allied Force air tasking order, as well as changes in the definition of which types of aircraft were included in the reported totals (a notorious problem in tracking aircraft deployed against Iraq at this time too). However, over time it became apparent that there were at least 2 systematic "discrepancies" in the official presentations of order of battle information. The first clearly derived from the careless (or perhaps extremely careful) use of the term "deployed", a term which the casual observer might associate with "operational in theater" aircraft, but which for NATO purposes apparently was also associated with "in theater but not yet available for operational tasking" or "committed and preparing to move to the theater." The confusion caused by this discrepancy was compounded by the apparent practice of providing order of battle aggregates for either Operation Allied Force, or for all operations associated with the Kosovo conflict, without clarifying which operations were included in the totals. 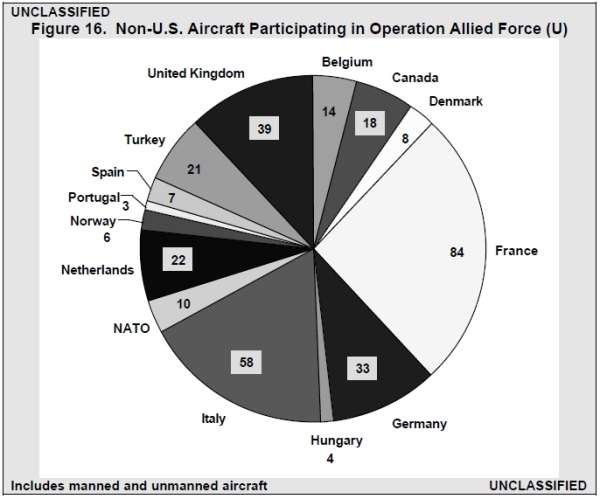 As of 6 May 1999, the US Department of Defense announced that the total number of US planes committed to Operation Allied Force was 639, along with 277 allied planes, for a total of 916 aircraft. This total apparently reflected "commitments" rather than actual deployments as of that date. Subsequently, it was announced on 21 May 1999 that the US total was 712 aircraft and the NATO total was 281 aircraft, while NATO announced on 23 May 1999 that the US and other NATO total was 852 aircraft. In early 1999, a total of as many as 430 aircraft from NATO countries were assigned responsibilities if called on. However, with the mid-March 1999 transfer of the aircraft carrier USS Enterprise from the Adriatic Sea to the Persian Gulf, the total number of aircraft tasked with Kosovo-related operations declined to fewer than 400 aircraft. With deployments of additional aircraft and helicopters ordered at the end of March 1999, the total rose to well over 500 aircraft, and with the arrival of the USS Roosevelt in early April 1999 the total was roughly 550 aircraft and helicopters. Additional aircraft assigned in mid-April 1999 brought the total to roughly 700 aircraft. The precise number was somewhat uncertain, since it did not include other combat aircraft in-theater assigned to other operations and responsibilities. While the announced number of non-US other NATO aircraft as of 16 April 1999 was about 190, the bottom-up bean-count total was about 235 aircraft, with the difference possibly reflecting the allocation of Italian aircraft to territorial airspace defense missions. NATO countries providing support first to Operation Determined Force, which began in October 1998, and then to Operation Allied Force, which began in March 1999, included Belgium, Canada, Denmark, France, Germany, Italy, Netherlands, Norway, Portugal, Spain, Turkey, United Kingdom and the United States. As of 25 January 1999, over 300 aircraft were committed to Kosovo operations and many of them were already deployed forward on stand-by at various air bases in Italy and other NATO nations or on carrier vessels. Depending on which of the limited air or phased air options was implemented, the sustainment of the operation was anticipated to require from 300 to 400 aircraft. Oddly enough, the USS Enterprise departed the Adriatic in mid-March 1999 to join the USS Vinson on station in the Persian Gulf shortly prior to the escalation of tensions over Kosovo, leaving no American carrier on station in the Adriatic to support Operation Allied Force. Ships and squadrons of the USS Theodore Roosevelt (CVN 71) Battle Group deployed on 26 March 1999 from their east coast bases for a scheduled 6-month deployment. In January 2000, the US Department of Defense released an Operation Allied Force after action report to Congress, in which it noted that on 24 March 1999, 214 US aircraft and 130 allied aircraft were poised at bases in Europe ready to initiate combat operations against the Federal Republic of Yugoslavia. B-2 aircraft operating from the heartland of the United States augmented these aircraft. By June 1999, the total number of US aircraft in Europe had grown to 731. During that same period, allied contributions more than doubled to over 300 aircraft. In addition, non-US NATO allies provided virtually all the basing facilities, air traffic coordination, and supporting elements to keep this air armada of over 1,000 aircraft functioning throughout the conflict. Figures and comments in grey cells represent otherwise unspecified deployments indicated by subsequently reported ORBAT totals. 08-Apr 546 354 192 23 UN-ANNOUNCED EUCOM MOVEMENTS ??? 09-Apr 566 374 192 20 UN-ANNOUNCED EUCOM MOVEMENTS ??? 02-May 819 588 231 13 US - 13 more, mainly bombers, close? 06-May 846 609 237 US commits 176 more, says 639 US and 277 Allied aircraft "committed"
11-May 882 609 273 22 France will send 22 more aircraft - closure date?? 12-May 918 645 273 36 ?? US additional 176 deploy ?? 15-May 932 659 273 14 ?? US additional 176 deploy ?? 17-May 939 666 273 7 ?? US additional 176 deploy ?? 19-May 961 688 273 25 ?? US additional 176 deploy ? ?